Make the most of your message! This sleek self mailer has a lot going for YOUR business. 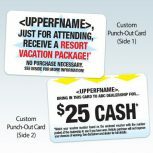 Personalized Punch-Out Cards bearing the ‘right offer’ are ideal as a clever way to get customers in the door! When popped out, the card is a simple portable reminder of how they will benefit right away from visiting your business. How will this work for my direct mail campaign? 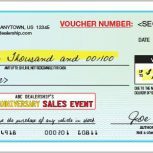 Included in the package is an eye-catching personalized self mailer with an affixed full-color voucher inside. 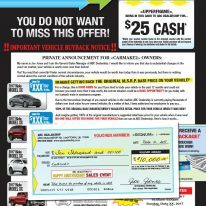 This mailer can be customized to your branding specifications and tailored to ANY industry for maximum conversions. 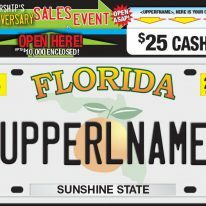 Bearing a customized license plate for your specific state and/or company branding on the cover, the design offers ample space for several elements, including three separate calls to action: custom voucher, punch-out card and a contest of your choice, thus increasing your chances for new business. Why use PrimeNet’s customized die-cut license plate with affixed voucher? 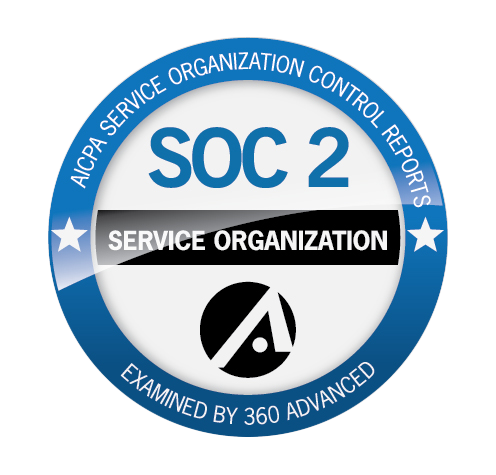 RESULTS! For every marketing campaign you’ve ever done for your business, you’ve expected results, right? 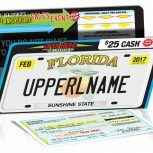 Well, with this Customized License Plate Mailer Package, the results will blow your mind! 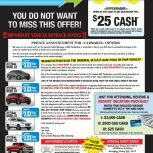 This package is certain to deliver the returns your business expects and deserves from your direct mail marketing efforts. Our marketing professionals will gladly work with you to build the perfect program centered around this type of campaign which will bring you the results you want while remaining well within your marketing budget. 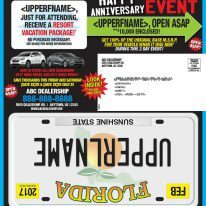 You have many options when it comes to your next direct mail program, so if you are looking to try something different – Something that WORKS – Ask about PrimeNet’s Die-Cut UV License Plate w/Punch-Out Card & Check Insert!